1)If two atomic orbitals overlap along the internuclear axis ,the molecular orbital formed is called σ molecular orbital. 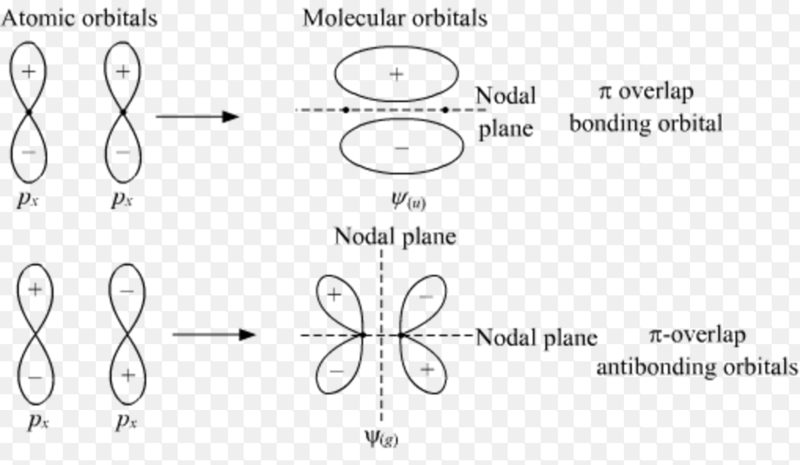 2)If two atomic orbitals overlap sideways, the molecular orbital formed is called π molecular orbital. 3)s orbitals are spherically symmetrical ,their wave function has the same size in all the directions. 4)In p- orbital, one lobe is given a + sign and the other a – sign. 5)Overlapping of + part of the electron cloud of one atom with + part of the electron cloud of second atom implies addition of the atomic orbitals leading to the formation of bonding molecular orbitals. 6)The overlap of + part of the electron cloud of one atom with – part of the electron cloud of the second atom means the subtraction of the atomic orbitals leading to the formation of antibonding molecular orbital. a) When both have the same sign. b)When they have different signs. The bonding and antibonding molecular orbitals formed are designated as σ (2s) and σ∗(2s).